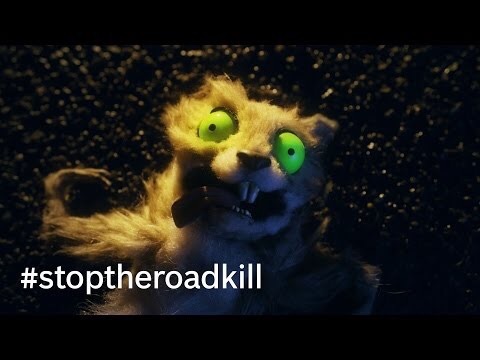 Roadkill Raps in Bosch Commercial! The commercial/public service announcement pushes the envelope, and is likely to shock if not revolt some viewers; their performance and their singing will, however, likely stick in your head! As a year-round fan of Halloween and horror, these singing furry zombies with a message furnished me with a perfect antidote for the Xmas merchandising we’ve been relentlessly exposed to since October…I’d buy their album! This entry was posted on December 24, 2015 at 4:31 am and is filed under animal spokepersons, animals, anthropomorphic, bizarre, furry, furry commercials, furry horror, strange, television. You can subscribe via RSS 2.0 feed to this post's comments. And I thank you for the idea for a new post! I had actually just seen this commercial for the first time just yesterday.